And the GNU Bar Winners Are….. Happy Monday all! I was up bright and early this morning at 5 AM to kick off my Bikini Bootcamp 2 week challenge. I started off by weighing in to get my starting weight and I won’t check again until day 15 (wow, can I control my scale obsession & not look?!) I put on some hot water and used that as my timer for my 10 minutes of meditation. I lit my body shop Mandarin Orange Oil Scents and sat in a comfortable cross legged position to meditate. I am still learning how to be a good meditator, but, I tried to focus on today’s theme “Intentions”, clear my head and let my thoughts flow down stream as I watched them from the beach. After medidating, I did 15 minutes of Sun Salutations Yoga. I ended the last 3 minutes with Child’s Pose and Corspe Pose. Ahhh ~ How I missed Yoga ~ it’s such an awesome way to start your day. I grabbed my cup of hot lemon water and sipped it while getting ready. They say that this is the first thing your drink/eat when you wake up to detox and cleanse your body. I actually LIKED it and didn’t miss having my decaf coffee. Wooohoo! 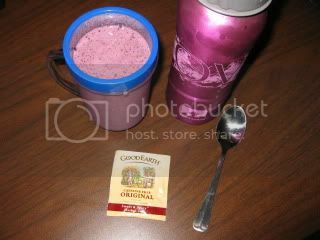 One I got to work, I whipped up a quick Blueberry Smoothie and will be having some herbal tea (it’s unlimited!) later on mid morning. It was thick, creamy and absolutely delicious. I felt so healthy drinking it and I am surprised that I am full/content. I did bring 2 healthy snack options in case I need them before lunch time (an apple – mild hunger, a banana – strong hunger). I’ll let you know if I end up needing either. * Click HERE to test your Metabolism I.Q. ~ It’s a fun quiz about busting Metabolism Myths. * Get active in June. Click HERE for your 30-days to an active lifestyle printable Calendar from Sparkspeople. It’s fun, simple calendar and I LOVE that you can check off each day as you move it and shake it! * For all those Vegan & Gluten Free Bakers out there, Karina’s Kitchen put together a baking cheat sheet that has everything you need to know. Click HERE to check it out. Ok, ok, I made you all wait long enough and READ (skip through) all of what I wrote above. So, here you have it ~ the much anticipated winners of the awesome GNU BARS. CONGRATULATIONS LADIES!!! Please email me your #1 and #2 selections of which two bars you want to try. Run gets first dibs, then, health, then nutritious. All of these girls have fabulous blogs, be sure to click on them and check them out. Thanks everyone for playing along in my GNU BARS Giveaway. It was fun to read all the ways you’d eat them ~ I think the consensus was just straight up tearing open the package. Ok ~ I am off to focus my “intentions” on getting some work done before I head of to Spin Class (that might be my walking for the day). Catch you all at lunch for a great salad + dressing recipe ala the Bikini Bootcamp eats! Wow! I won! How awesome! 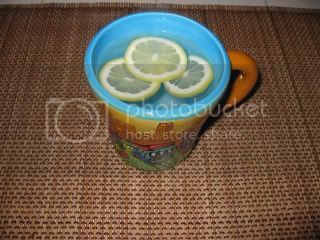 Hot Lemon Water sounds very refreshing! Hooray! I LOVE these bars. I don’t have a retailer in my area, so now I’ll be able to satisfy my craving! 😉 Thanks Danica!!! Congrats you winners! Chew a Gnu for me! Wow, Danica! I am impressed with your 5 a.m. wake up call! Good luck with the challenge; it’s sounds intriguing. Looking forward to coming along for the ride with you! Nutritious ~ Congrats! I am surprised I LOVE the lemon water so much. Mary ~ You are too funny – love the analogy. Anne ~ Luckily I am a morning person so I am ok with getting up early. If I had to stay up late I probably wouldn’t be able to do it.